SUP is among the fastest growing water sports in the world. Go for a gentle paddle and just enjoy the awesome feeling of standing on the water. Do SUP yoga and work on your balance. Push harder and it's one of the best core workouts you can get. Harder still and it's a cardio workout too! If you are a beginner, the SUP fleet is by far the fastest way to get on the water at Club Locarno, as lessons are not required. You only need to do our one-hour free checkout to learn how to stay safe and take care of the board. 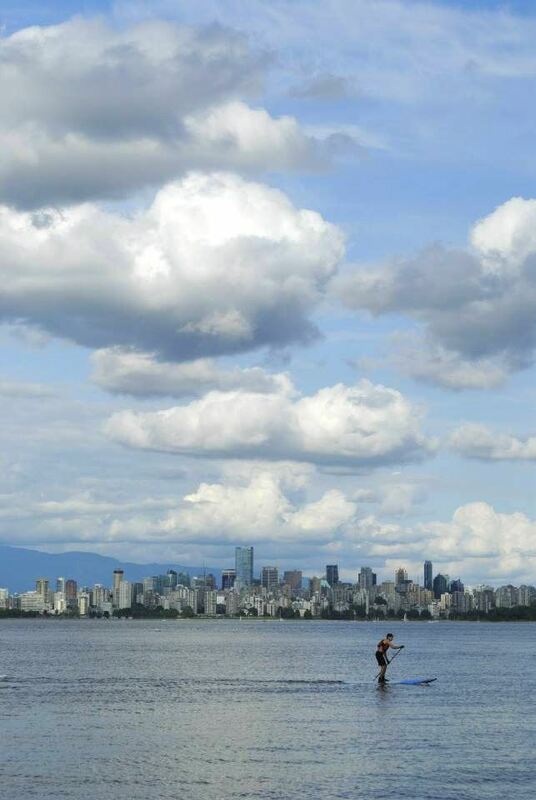 With our new equipment, expanded fleet and inexpensive memberships, Club Locarno, at Jericho Sailing Centre on English Bay, is Vancouver's best and most scenic place to SUP. There is something for everyone, from beginners to strong recreational paddlers, and even racers, with a mix of adjustable and fixed length paddles. We also provide board leashes and PFDs for members to use. There are 2 levels of membership for the SUP fleet. Level 1 has a wide variety of plastic boards, and should suit most members looking for recreational paddling. Access to level 1 requires a one-hour free checkout. Level 2 is for experienced members who want to go faster, for long distance paddling (e.g. touring) or racing. These boards are made of fibre glass or carbon fibre. Access to level 2 requires a separate additional free checkout, to ensure good paddling technique and appropriate care of the more fragile boards. All club members must wear a PFD when on the water. All level 1 fleet members must use a leash. Level 2 members must use a leash when it's windy (8 knots or more). We currently have 12 SUP boards, including two new boards for 2018 (two level 2 14' boards, one for racing and one for touring - to be added to the list below soon). 3. Shorter boards tend to be more maneuverable and lighter, but they are slower and can have lower volume, making them tippy for heavier/taller paddlers. #5 - 2017 10'5" inflatable Starboard Drive Deluxe. Despite the (average) width of 30", its lightness (only 9Kg) and the inevitable flex associated with inflatable boards can make it quite tippy, depending on the weight and ability of the paddler. This is a great board for anyone to work on their balance, in case they want to move to faster and tippier level 2 boards, or consider surfing. It's also suited for lighter and shorter paddlers who perhaps have trouble carrying a heavy board, or any more experienced paddler who wants a challenge. It's technically rated for paddlers up to 90Kg, but anyone on the taller side or weighing more than 50 or 60Kg should have better than average balance to enjoy this board. Board #7 - 10'6'' wide board, about 33" wide. This soft top is a very stable board for beginners or yoga, but it's on the heavy side. Board #8 - 11'6'' wide board, about 33" wide. This soft top is a very stable board for beginners or yoga, but it's on the heavy side. Boards #9, #10 - 2014 12'6'' 2013 BIC Sport Ace Tec Wing touring boards. A fairly high 285 litre in volume, for paddlers up to 120Kg. When compared to boards #1-#4, these have much better tracking, but despite the high volume, they are tippier, at around 30" wide. These are our fastest level 1 boards. These are plastic boards. Although plastic is fairly resilient, it's also harder to repair than fibreglass, and the plastic on these boards is thinner than that on the Bic Surf Ace Tec boards. Dropping or dragging them can damage the seams, making them leak. Board #11 - 2016 14' Amundson Hawaii TRX (27" wide). With all-carbon construction, this board is stiff and light for its length. This is a level 2 board, and can be used for touring or racing. It has great tracking (which also means it won't take tight turns without stepping way back on the board) and great glide, because of its length. It's only appropriate for experienced paddlers, as a beginner would find it way too tippy. The Amundson Hawaii is made of bamboo/carbon, has a volume of 270 litres, and weighs 26lbs (11.8Kg). Recommended paddler weight: from 175lbs (novice) to 275lbs (advanced). As with any other carbon board, keep in mind that carbon fibre is actually very brittle (e.g. it breaks easily on impact). The board must be handled with care. When paddling back to the beach, make sure you always stop well before hitting the beach. Never put it down on concrete - only on the stands, water, or gently on the beach (after making sure there are no rocks in the sand). Board #1 - With the same shape as boards #2, #3, #4, this BIC Surf Ace Tec 10'6'' board (three fins) is great for lighter paddlers (under 50 or 60Kg) or anyone who wants more maneuverability. It's quite stable, at 32" wide, and it's also lighter, making it a bit easier to carry it to the beach. It is slower than longer boards, particularly if you are a heavier paddler. They can be used for general recreational paddling and surfing. Boards #2, #3, #4 - BIC Surf Ace Tec 11'6'' are great boards, suitable for most paddlers. With a balance of maneuverability and tracking, they are quite stable at 32" wide. For paddlers up to 110Kg, although those over 90Kg may need good balance, particularly if they are tall. They can be used for general recreational paddling and surfing. Step 2: Complete a mandatory Club Locarno SUP checkout. Click here for schedule! Step 4: Hit the water on your Club Locarno SUP!